Ra is a departure from my usual free form work. 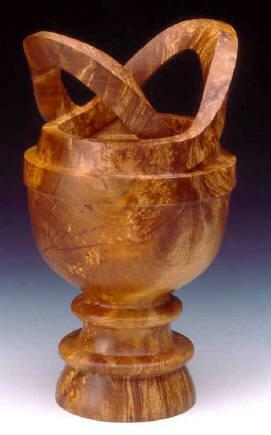 I am drawn to antiquity for inspiration, particularly for my turned and sculpted works. Ancient vessels that were produced around the Mediterranean rim especially captivate me. In my research I came across the image of an ancient Egyptian ceremonial urn. I liked the form and symmetry and adapted those characteristics into this piece I call Ra, named after the Egyptian sun god.